ACS Industrial Services, Inc. is not affiliated with nor an authorized distributor or representative of any manufacturer, brand or product listed. Designated trademarks, brand names and brands appearing herein are the property of their respective owners. Under the weird but true category, we sometimes get rodent damaged electronic equipment in for repairs. And it’s not always just the gnawing that causes the damage, it’s also what happens AFTER they EAT your wiring (yes, that! Yuck!). It’s autumn and it’s getting colder! If you think about that for a second, it’s not strange that these critters would seek out warmth and possible food sources that are found in most any manufacturing plant. 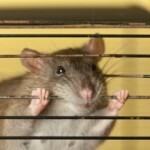 Rats and mice can gnaw through many tough materials including lead, aluminum, window screens, wood, rubber, vinyl, fiberglass, plastic, and poor-quality concrete and concrete blocks. Rats only need a ½” inch opening to squeeze in, can drop 50 feet without injury, burrow straight down into the ground for 36”, jump 26 inches vertically and 48 inches horizontally, swim for a ½ mile, and dive through water traps in plumbing. Talk about an IronRat race! Look for signs of entry – Look for droppings, tracks, gnawing marks (a professional pest management company really is the best for this as they have all of the appropriate equipment). Don’t Invite – Keep the area surrounding your plant free of clutter and debris, tall grass and vegetation, open trash, and standing water; and make sure your dumpster is on a cleanable concrete pad. Doors should fit tightly – Rodents usually enter after dark so avoid leaving doors open at night and make sure your door bottoms are not dented and damaged and the floor is even so no gaps are available. Use metal thresholds. Repair damage quickly – Regularly check for and repair cracks or damage to exterior walls, floors, and openings in windows and screens. 1/4 inch! That’s all they need to scuttle in! Button –up – Tighten up with rodent-proof sewer, electrical, communication, water, and gas services, and keep elevator pits clean and dry. Control Loading Docks – Get rodent exclusion devices and use automatic door closers; dock bumper pads should be at least 30” high to keep rats from using them as a launch pad onto your dock. Installing guards helps – Install guards made of smooth sheet metal that are wide enough and positioned to keep rodents from climbing, traveling or jumping from the guard wherever they are needed. Rodent/Pest control is a huge subject and you can find more information from the National Pest Management Association, or any professional pest management company. If your electronic equipment is damaged by pests, it can usually be repaired. Most industrial electronic equipment, including older and out of warranty electronics, can be repaired at a considerable savings over buying new. If your damaged electronic equipment is still under warranty, contact the OEM about repairs. If it is out of warranty, contact an independent industrial electronic repair center to find out if they are a good fit for your company and your particular repair needs. They should offer free evaluations for your damaged equipment and, if needed, a free quote for repairs (no bench fees!). They should also provide repair reports if requested and a good warranty of at least one year that covers both parts and labor. About the Author: ACS Industrial Services is an independent industrial electronic repair center providing repair services for printed circuit board s of all types and manufacturers, drive repairs, servo motor repairs, CNC equipment repairs, encoder repairs, monitor and touchscreen repairs, PLC repairs, test equipment repairs, light curtain repairs, and much more. The customer service team is available to answer your questions and help solve your most challenging industrial electronic repair concerns. You can reach them by calling 800-605-6419 or going to www.acsindustrial.com . © ACS Industrial. All Rights Reserved.